In the Customer file there are four fields that store the age amounts for period‑1, period‑2, period‑3, and period‑4 for each customer as of the last age date. 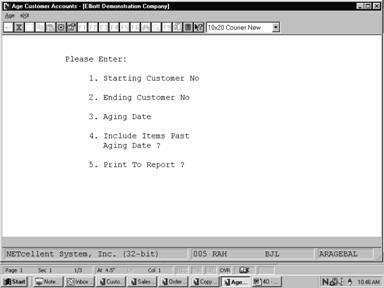 The primary use of these fields is for display during Customer Account Inquiry or for use with the Report Writer. In order to keep these fields current, it is necessary to age customer accounts periodically. 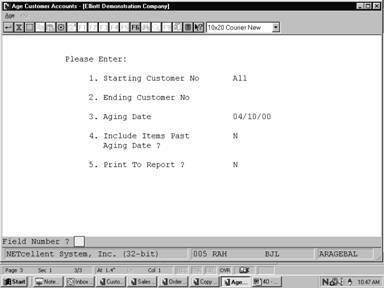 These fields are up­dated through Print State­ments (if print aged totals is Y), or by run­ning this application. Because statements are usually only run once in a period, these age amounts may not be current. This application can be run as many times as needed to keep these age amounts current between statement periods. Enter the beginning of the range of customer numbers you want to age account balances for. If you press RETURN the system will default to All customers. Enter the ending of the range of customer numbers you want to age account balances for. If you press RETURN the system will default to All customers. A date in the standard date format. Enter the date to be used for calculating the age of the cus­tomer account balances. This date will also be the date that appears as the last statement aging date in the customer file. This field defaults to the system date. If you answer N to this question, no open items whose date is after the aging date will be in­cluded in the age balances. On the other hand, if you answer Y here, all items will still be aged as of the aging date, but all open items on a customer’s account will be included. Any items not yet due will appear in aging period one.